Export unlimited issues to multiple formats with all the context that matters: comments, transitions, and attachments. Migrating entire Jira instances used to be a daunting task. With Exporter, it takes mere seconds. Use issue transitions and otherissue data to audit your internal processes, including SLAs response times on Jira Service Desk. Migrating entire Jira instances used to be a daunting task. With Exporter, it takes more seconds. Manipulate your issue data in a spreadsheet, load it into your favorite BI app, or share it with stakeholders. "The export add on is just what we needed to be able to quickly export the data in usable format. I'm also satisfied with the response. 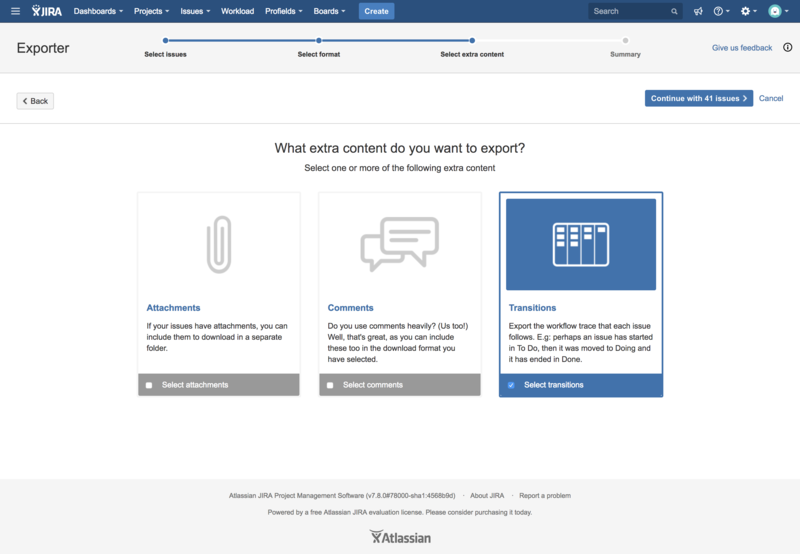 We required some support after the GUI changes by Atlassian the Deiser team was very responsive and quick in solving the issue." "Hi. The new release of Exporter Cloud came with a problem of licenses and did not work. I've reported the issue, and Exporter worked again. The support team reacted very quick, and the issue was solved in only a few minutes. Thank you very much for your efficiency." "Very helpful tool, really help me to do my job. Moreover, the support team is really dedicated and give quick answers everytime. Keep it up ! Thank you and great job." "The app do the job and the support team react very quick! Thank you!" "No discussion, this tool is very helpful: Exporting tickets with a lot of options and this without server load. In additional the support staff responded very fast with a valid answer! Great job, thanks!" Include attachments, transitions, comments, and custom fields in the export files. Don't lose content or context about your issues. Comma, semicolon, or the name of your pet. Use the custom delimiter to ensure your CSV files are ready for importing into Jira... or any other tool. Exporter will be your most loyal reporting agent. Choose a filter in the issue navigator, schedule how often you want to export it, and go grab a coffee. Exporter cloud licenses are hosted by DEISER. Your subscription automatically renews every month. Annual pricing is also available. You are eligible for support and automatic version updates as long as your subscription is active.